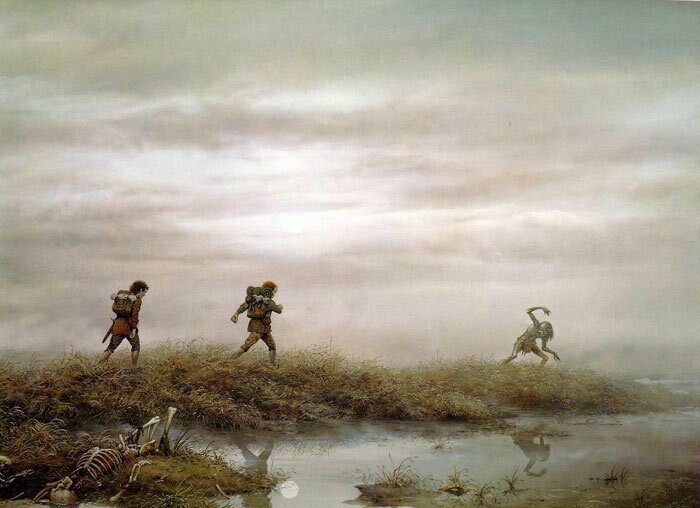 They had come to the very midst of the Dead Marshes, and it was dark. They walked slowly, stooping, keeping close in line, following attentively every move that Gollum made. The fens grew more wet, opening into wide stagnant meres, among which it grew more and more difficult to find the firmer places where feet could tread without sinking into gurgling mud. The travellers were light, or maybe none of them would ever have found a way trough. Presently it grew altogether dark: the air itself seemed black and heavy to breathe. When light apperared Sam rubbed his eyes: he thought his head was going queer. He first saw one with the corner of his left eye, a wisp of pale sheen that faded away; but others appeared soon after: some like dimly shining smoke, some like misty flames flickering slowly above unseen candles; here and there they twisted like ghostly sheets unfurled by hidden hands. But neither of his companions spoke a word. Sam looked back and found that Frodo had lagged again. He could not see him. He went some paces back in the darkness, not daring to move far, or to call in more that a hoarse whisper. Suddenly he stumbled against Frodo, who was standing lost in thought, looking at the pale lights. His hands hung stiff at his sides; water and slime were diping from them. 'Who are they? What are they?' asked Sam shuddering, turning to Frodo, who was now behind him. Copyright Notice: Ted Nasmith has given explicit permission to reproduce his painting on this page. Commercial use of the picture withous his consent is forbidden. To the article on Tolkien & Frodo in the Great War.